“Animal Plasma” is the term set forth by the American Feed Control Officials to describe serum-derived biologically active proteins. This is not “nutritional protein” in the sense of what you might find on a feed tag. This is “functional protein” which contains over 1,000 biologically active components that improve the body at the cellular level. Could Bioactive Proteins in Animal Plasma Help My Horse? When the body is in distress, it needs support from biologically active proteins. For example, when a horse has gastric ulcers, the lining of the stomach is in distress with open sores and inflammation. When a horse is a bleeder (exercise induced pulmonary hemorrhage), the lung tissue is rupturing causing distress and inflammation. When a horse has allergies or hives, the immune system is in distress and reacts with an inflammatory response. When a horse gets nervous, the digestive system is in distress as blood is diverted away from the digestive process. If your horse is ever in a situation that causes stress within the body, the bioactive proteins in animal plasma may help. How Do Bioactive Proteins Work? Biologically active proteins in animal plasma enter the body through the digestive tract after they have been eaten by the horse. From there they move to different areas of the body through gut-associated lymphoid tissues (GALT) targeting areas in distress. Research has shown benefits in the lungs, gut, uterus, brain, immune system, and even stride length and joint range of motion! Biosafety is a major concern. All plasma is sourced from healthy animals at federally inspected abattoirs. These animals have NEVER been fed medications such as ionophores or ractopamine, therefore no chance of toxicity or a positive drug test in horses fed this ingredient. Photopurification, spray drying, and heat treatments ensure the plasma is free of viruses, bacteria, and protozoa. There are over 300 peer-reviewed, scientific studies on animal plasma. It has been evaluated in multiple species including horses, humans, cattle, pigs, poultry, and mice. While biologically active proteins from animal plasma are relatively new to the horse industry, they are a staple for health management in much of animal agriculture. Over 2.5 million calves each year consume bioactive proteins and it is included in 95% of pig starter diets in the U.S.
Where Can I Buy It? STRIDE® ANIMAL HEALTH is the ONLY SUPPLIER for the United States equine market that uses the high quality Animal Plasma described above. 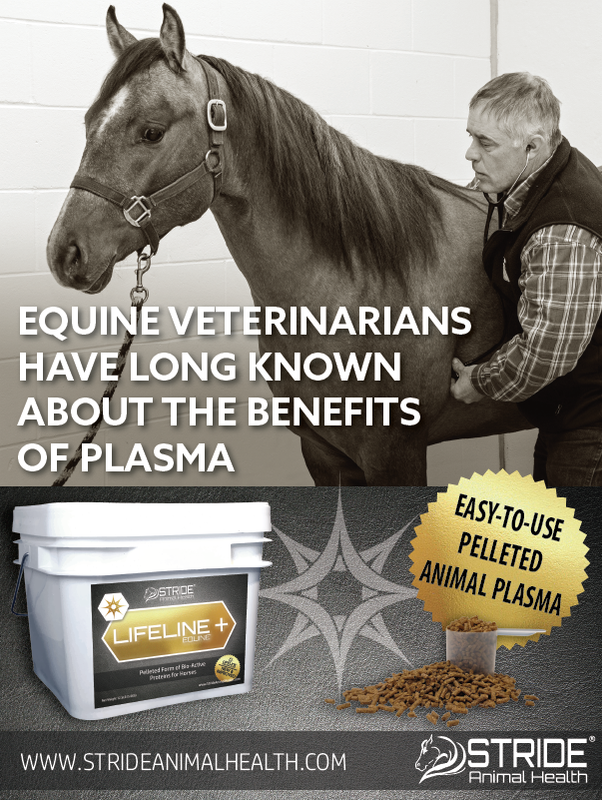 It can be purchased as a pelleted supplement called LIFELINE+ Equine®. You are guaranteed a safe product backed by scientific research, and a company that understands horses.